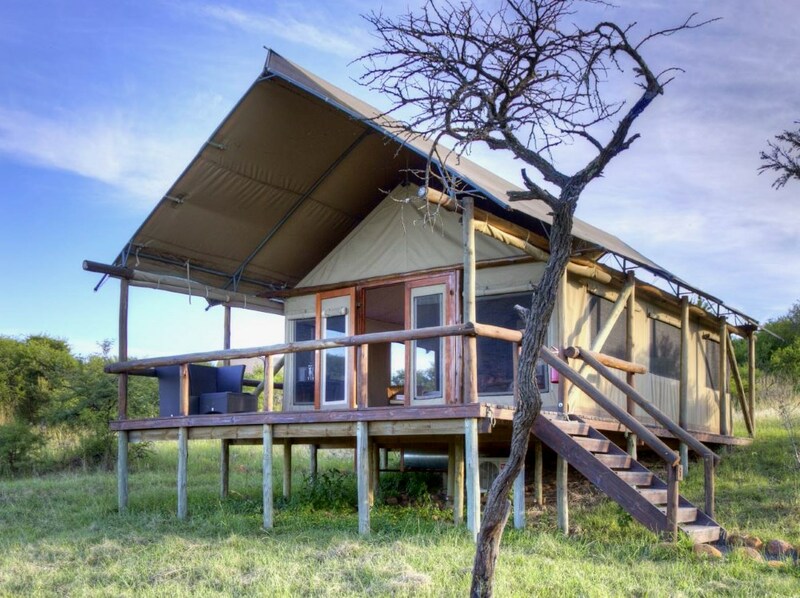 The first tented camp in Nambiti, Springbok Lodge also offers superb value for money! the first tented lodge in Nambiti and so offers a slightly different experience to the others – combine this with pricing that is a bit sharper than most of its rivals and you can see why Springbok Lodge has quickly become one of our best sellers! Nambiti has rapidly become one of our best-selling reserves and it’s not hard to see why: the reserve offers both superb scenery and excellent game viewing, which combined with its easy access from both Johannesburg and Durban and a selection of excellent lodges to choose from (all at great value prices) constitutes a real winner! Springbok Lodge has managed to successfully differentiate itself from the other lodges in the reserve in that it was the first tented lodge in Nambiti and so offers a slightly different experience to the others – combine this with pricing that is a bit sharper than most of its rivals and you can see why Springbok Lodge has quickly become one of our best sellers! 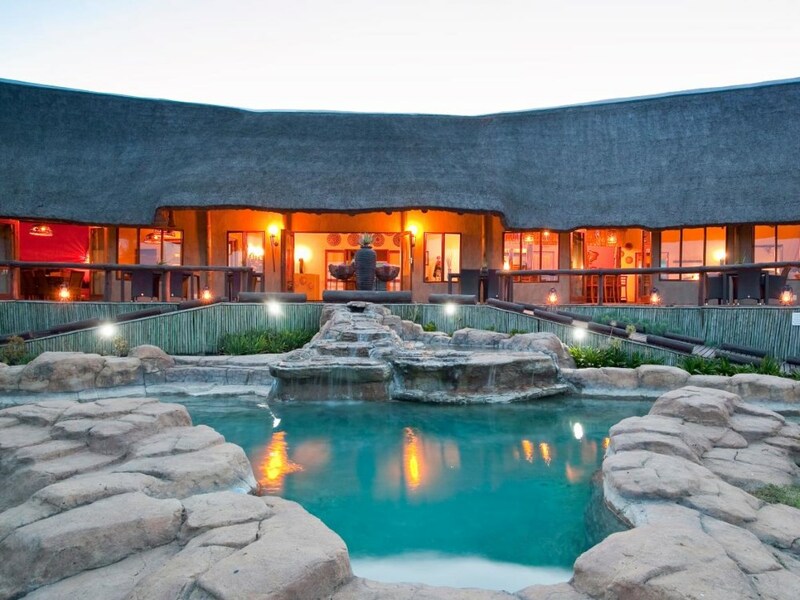 As far as the main lodge building is concerned , it’s very much in the traditional game lodge style with an expansive thatched roof enclosing the reception, curio shop, dining room, bar and lounge area complete with fire place where you can relax with a good book on chilly days. Outside a large wooden deck overlooks an expansive lawn area and the inviting swimming pool that resembles a natural rock pool. On those sweltering summer days this is the perfect place to simply chill – and who knows, perhaps you might even be joined by BFE, Nambiti’s most famous elephant bull, on the hillside in search of his next meal! If we had to be really picky, it would be nice to have more shaded areas on the pool deck, whilst the inside lounge area being all one space under a very large roof perhaps lacks that really cosy feel. Heading off from the lodge on your twice daily game lodges you’ll rapidly see why staying in Nambiti leads to so many happy guest reviews. Whilst it obviously lacks the reputation for Big Five sightings that reserves like the Sabi Sand are able to boast, Nambiti certainly delivers a hugely enjoyable game drive experience. Whilst the ever elusive leopard sightings are growing but still pretty rare, you’re likely to get very decent sightings of a wide range of game including elephant and lion, rhino and buffalo (not to mention more kudu than you could possibly imagine!) The quality of game viewing on offer certainly took us hugely by surprise when we first visited Nambiti back in 2011 and continues to go from strength to strength. Keen birders too will be treated to a variety of twitters – including seasonal migratory birds. But more than just the animals on view, Nambiti also offers up some truly spectacular landscapes that constitute nearly as much of an attraction for many guests (from expansive grassy plains that remind us more than a little of the Serengeti, to rolling hills covered in thickets) – it’s the Sundays River gorge that makes its way through the reserve complete with waterfalls and steep cliffs that are perhaps the highlight though from an aesthetic perspective. And the good news is that just as the game viewing is ever-improving as the reserve matures, so the visible clues that this was previously farm land are becoming more difficult to spot. Heading back to the lodge you’ll be welcomed back by the enthusiastic and genuinely friendly lodge staff and management – the service and attitude of the staff is consistently raved about by our guests in fact! If the weather’s good perhaps you’ll get to enjoy a traditional boma dinner around the open-fire under the stars, alternatively a 3 course dinner is served in the dining room or deck (weather depending) Again the food is consistently well rated by our guests, which is yet another pleasant example of over-delivery given the very reasonable rates at Springbok Lodge. One final aspect that we also need to touch on is that Springbok Lodge is one of the few lodges that caters to the small corporate groups market and is absolutely ideal for a management team weekend breakaway for example. It is handily placed for access from both Johannesburg and Durban, whilst the 15 tents (with 5 more on the way during 2014) is large enough to handle such small groups comfortably. Finally, it has a dedicated conference room (for up to 40 people) that has all the usual equipment required. Children 3 - 11 years when sharing with two adults will pay a reduced rate. 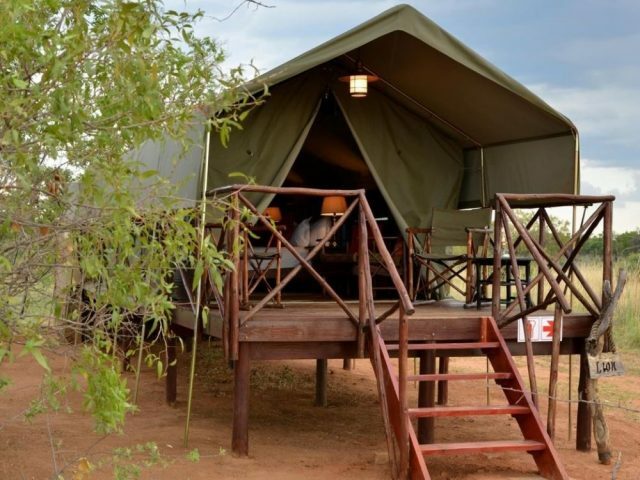 Intimate little bush camp of just 5 simple tents offering a taste of old-fashioned safari style just 2 hours north of Johannesburg. 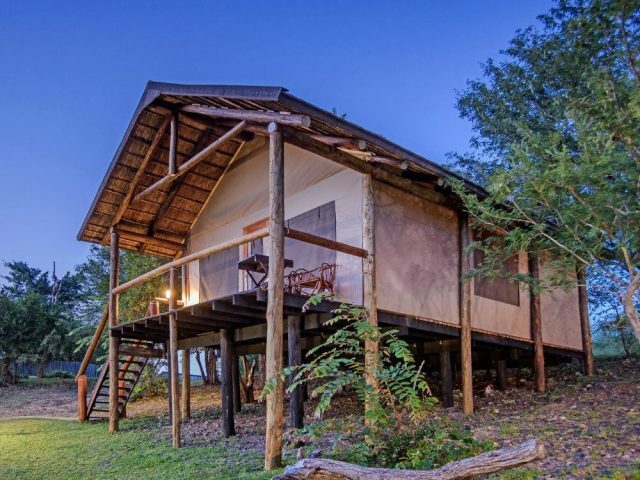 A simple tented safari camp offering you excellent viewing of the Big Five in this most scenic of lowveld private reserves – great value!